America's Current Situation – How Did We Get Here? The Federal Nuclear Waste Policy Act of 1982 requires the U.S. government to take possession of used nuclear fuel from commercial nuclear power plants in the U.S., including San Onofre Nuclear Generating Station. Specifically, the U.S. Department of Energy was required to provide a national storage facility and begin accepting used fuel by 1998. To date, DOE has not delivered on its mandate to provide such a federal repository. In the meantime, used fuel is accumulating in spent fuel pools and dry cask storage systems at both operating and shut down nuclear power plants across the U.S.
Like many other nuclear plants across the U.S., SONGS already has transferred much of its used fuel from cooling pools into dry, stainless steel canisters that are individually sealed, passively cooled and stored in a dry storage system known as an Independent Spent Fuel Storage Installation (ISFSI). Storage of used fuel in dry cask storage containers is done only after several years of the used fuel being cooled in the spent fuel pool. Once the rate of residual decay heat generation in the used fuel becomes sufficiently low, the passive air cooling of the dry storage casks in the ISFSI can prevent the fuel from ever overheating. In addition, packaging used fuel in stainless steel canisters, such as those used in the ISFSI at SONGS, is the first step to prepare the used fuel for transport offsite. The most feasible near term opportunity to move SONGS used fuel offsite appears to be shipping the used fuel to a consolidated interim storage facility, such as those that are being planned in New Mexico and Texas. Below are some frequently asked questions about the dry cask storage of spent nuclear fuel. Q: How does dry cask storage of spent nuclear fuel work? Dry cask storage systems for spent nuclear fuel protect people and the environment from radiation, using thick concrete for shielding and physical protection for the storage canisters. The seal-welded stainless steel canister provides containment for radioactive material which is further contained in sealed zirconium alloy tubes (fuel rods) inside the canister. Passive cooling employs natural convection air flow to maintain spent fuel in a safe condition. Dry cask storage does not use water or fans for cooling and electric power is not required. Radioactive material is contained in ceramic pellets that are sealed within fuel rods. 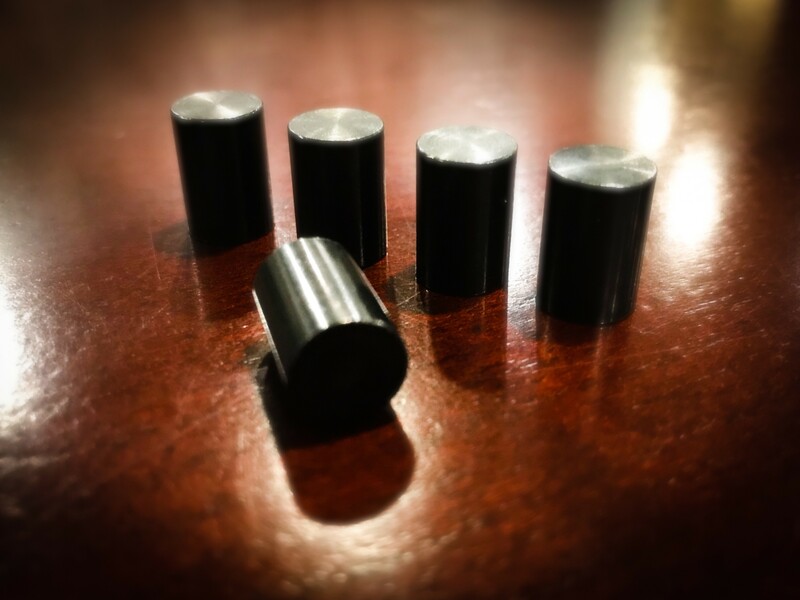 Fuel rods are organized into fuel assemblies that are housed in sealed stainless steel canisters. Canisters are stored in thick concrete overpacks that provide radiation shielding and physical protection against mechanical contact and precipitation. ​Collectively, the canisters and overpacks provide shielding, containment, physical protection, and passive cooling. Q: What is the expected service life of the SONGS used fuel canisters? The used fuel canister manufacturers for SONGS (AREVA and Holtec) state the service life for both the AREVA NUHOMS and Holtec UMAX used fuel canisters is 100 years. However, independent engineering analysis concludes that the NUHOMS and UMAX canisters at SONGS are likely to maintain containment for more than 100 years based upon selection of Type 316L stainless steel and considering actual experience with the primary canister degradation mechanism (Chloride Induced Stress Corrosion Cracking) at SONGS. The laser peening process applied to the welds on the newer SONGS Holtec UMAX canisters is expected to further extend canister service life. Q: What is the U.S. commercial nuclear industry’s experience with dry cask storage and degradation? There are currently more than 2,000 stainless steel canisters loaded with used fuel in service at more than 70 different commercial nuclear sites in the U.S. Over ten of these sites are in marine environments similar to San Onofre. The oldest stainless steel canisters have been in service for more than 20 years and no degradation of any dry cask storage system components has been reported. This includes the Calvert Cliffs Nuclear Power Plant, located on the shores of the Chesapeake Bay in Maryland, a marine environment. Q: What would happen if a SONGS spent fuel canister sustained corrosion that led to a crack and that crack grew through the wall of a canister? Holtec canisters at SONGS are made from 5/8" thick 316L stainless steel. Though highly unlikely, if over time a crack grew through the wall of a SONGS used fuel canister, there would be no significant release of radioactive material from the canister, no spread of radioactive contamination offsite and therefore no radiological exposure to the public. The consequence of a breached used fuel storage canister has been evaluated by tests performed by the Department of Energy and by extensive NRC approved analyses of accidents involving leaking canisters. These tests and analyses conclude that a breached canister will not result in radiological exposure. The primary reason that a crack through the wall of a used fuel canister will not release a significant amount of radioactive material is that the fuel rod cladding (i.e., sealed tube material) will remain intact and continue to provide a very effective first barrier to release of radioactive material. A second reason is that there is very little motive energy available in a used fuel canister to force solid radioactive material through a crack in the canister wall. Q: How would a potentially compromised SONGS used fuel canister be repaired or replaced? If an unacceptable condition is found on a SONGS used fuel canister, there are a number of possible responses depending on the specific conditions. In some circumstances, such as an isolated crack, a remote weld repair procedure might be the best solution. Under other conditions, the deficient canister could be removed using canister transport equipment and placed in a larger cask on site. 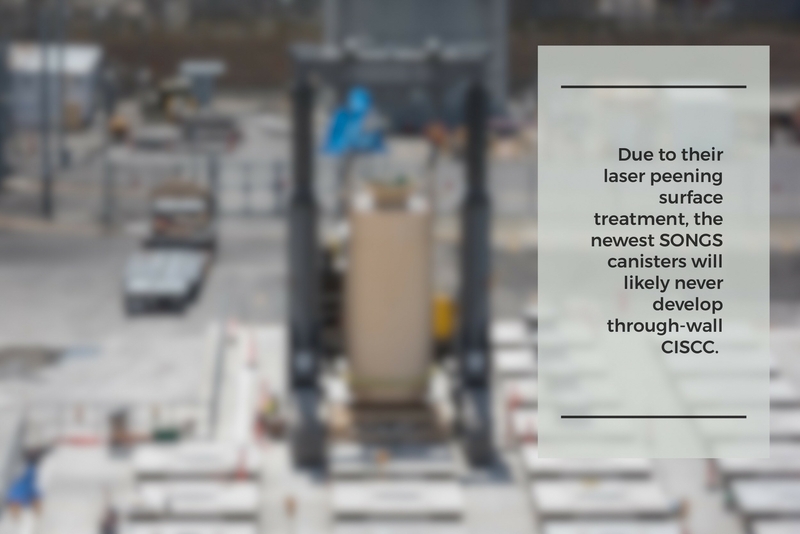 In still other circumstances, a deficient canister might be shipped to an offsite facility for repacking, using an overpack for radiological shielding during transportation. The barriers provided by the used fuel dry storage system include (1) the fuel rod cladding, (2) the used fuel canister and finally (3) the surrounding concrete structures. The combined effect of three independent barriers provides a high degree of assurance that no significant amount of radioactive material can reach the environment. Q: Isn’t a spent fuel pool necessary to make repairs to a damaged canister? Spent fuel pools are not the only way to provide adequate shielding during used fuel handling and repackaging. A deficient used fuel canister could be installed in a “repair” cask with a larger diameter on site using existing dry used fuel handling equipment without use of a spent fuel pool. This “repair” cask could then be stored in a shielded location above ground or in an oversized storage location such as the one already planned at SONGS as part of the Holtec UMAX system. Q: But what about the salty sea air? The SONGS ISFSI is in a marine environment. The service life limiting degradation mechanism for used fuel canisters in a marine environment is expected to be chloride induced stress corrosion cracking (CISCC). For CISCC to penetrate a stainless steel canister, it requires a buildup of chloride salts, water, and through-wall tensile stresses. The buildup of chloride salts takes years to deposit from air circulating over the dry surfaces of the canister. No rain can wet the canister but humidity in the circulating air can result in wet salt deposits under specific humidity conditions, but only after the surfaces of the canister have substantially cooled, which usually takes over 20 years. The few areas that have the potential for through-wall tensile stresses are the shell weld zones. To minimize the risk of CISCC, canisters at SONGS are fabricated from Type 316L stainless steel (best stainless steel for marine environments), which is highly corrosion resistant. CISCC has been infrequently observed in stainless steel materials used in other nuclear plant components with wetted sea salt contamination over many years of operation. 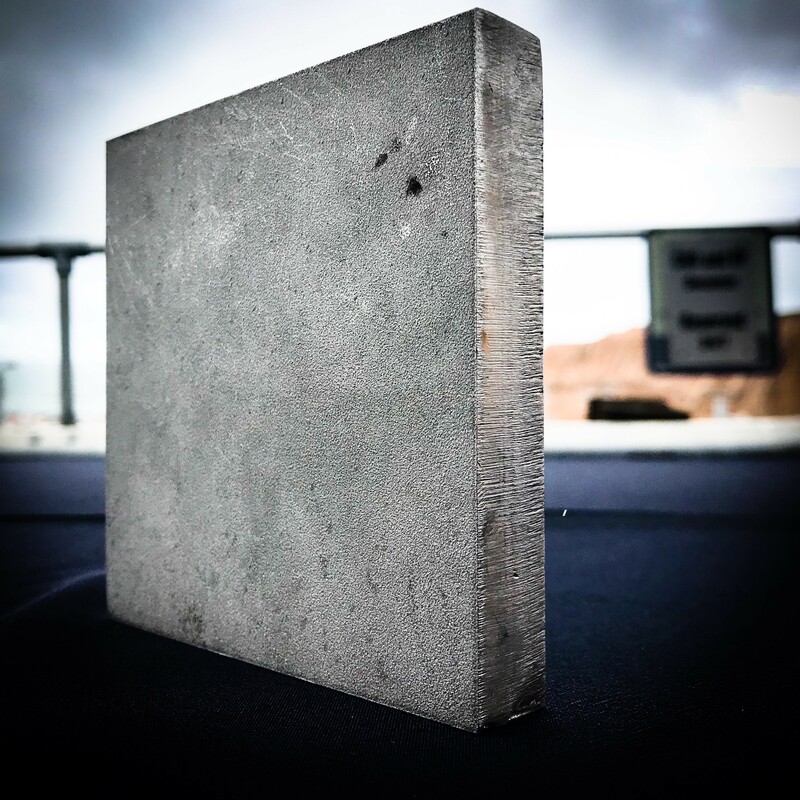 While that experience is relevant, the physical protection afforded by dry storage system concrete shielding and the elevated operating temperature of the canisters present key differences in whether or not CISCC can occur. Conservative extrapolation of the industry experience with dry storage canisters leads to a lifetime projection of more than 100 years for the SONGS Type 316L stainless steel canisters. Q: What about spontaneous fission of the spent fuel? Could that happen and melt the fuel? No. In order to raise the temperature of the fuel, a large amount of energy needs to be generated by establishing a self-sustaining nuclear reaction. Spontaneous fission is a normal process that occurs in uranium before mining, in a reactor core, and in used fuel. In all the spent fuel in a canister, spontaneous fission gives off heat at a lower rate than the smallest hearing aid battery. Q: Can the spent fuel “go critical”? To achieve criticality, with a self-sustaining nuclear reaction, SONGS spent fuel would need to be taken out of the cask, rearranged, and flooded and surrounded by water, which are events that the spent fuel cask is specifically designed to prevent. For example, the basket sleeve material separating the used fuel assemblies within the canister are made with neutron-absorbing boron, adding further prevention against criticality occurring.